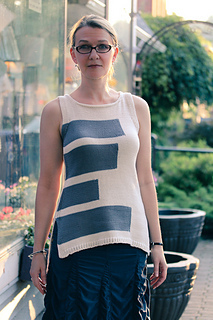 Bold blocks of intarsia decorate the front and back of this long and lean tank. Worked flat from the bottom up with a slightly longer back, the built-in rib edging is seamed at the sides, leaving slits at the hem. Waist shaping and an a-line flare at the hip emphasize the casual breeziness, and deep v-shaped armholes add to the linear styling. Construction: Block Theory is worked separately for front & back from the bottom up, beginning with an Italian tubular CO that flows beautifully into narrow ribbing, and then transitions to stockinette stitch with intarsia color blocking. The narrow rib continues up the sideseam and armhole edge, with shaping worked within the body for hip, waist and bust, making it simple to seam the front and back together beautifully, and eliminating the need for armhole finishing. 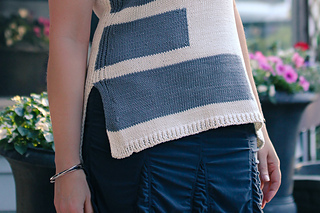 A shallow scoop neck worked with a few short rows balances the cut-out armholes, the shoulders are seamed with a 3-needle bind off, and then tidy minimalist applied I-cord finishes the neckline. The width and spacing of the intarsia color blocks grows through the size range, to create a similar visual result for all sizes. Techniques & Skills Used: Italian tubular CO, knit/purl,increasing/decreasing, intarsia, German short rows, cable CO, applied I-cord (provisional CO and grafting), 3-needle BO; links are provided to my techniques tutorials. Size: 32 (34, 36, 38, 40, 42, 44, 48, 52)” bust; shown in second size worn with 1” negative ease. Yarn: Cascade Yarns Ultra Pima (100% pima cotton; 220 yards/200m/100g), shown in MC 3718 Natural and CC 3729 Gray; 2 (3, 3, 3, 3, 3, 3, 4, 4) skeins MC and 1 (2, 2, 2, 2, 2, 2, 2, 2) skeins CC, or approximately 425 (475, 500, 525, 575, 600, 625, 725, 800) yards of MC and 210 (230, 250, 270, 290, 310, 330 360, 390) yards of CC dk weight cotton or cotton blend yarn. Other Materials: US 5 (3.75mm) 32” circular needle or size to match gauge; US 4 (3.5mm) 32” circular needle for CO; Stitch markers (4); Stitch holders (3); Yarn needle. Gauge: 22 st and 28 rows/4” in Stockinette stitch, after blocking.